We've improved our Teaching Children to Pray series by adding more great lessons! Ready to copy and use, this series is for teachers on the go. You'll find an age appropriate prayer, memory verse and teaching on each page, arranged by theme with indexes for easy look-up. The lists of materials and directions couldn't be simpler, freeing you to extend the lesson with extra Bible-teaching. Get your kids praying today! 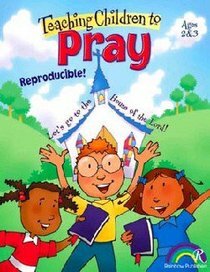 About "Ages 2 & 3 (Reproducible) (Teaching Children To Pray Series)"
Order now to secure your copy when our stock arrives. Other edition is available. 1885358237 0 Available. Expected to ship in 5 to 6 weeks from Australia.